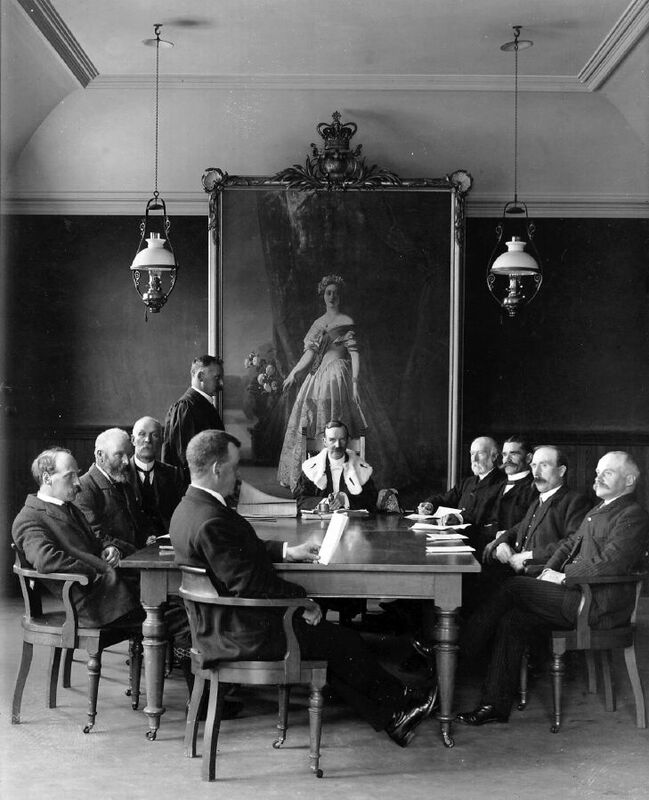 Mounted photograph of Dornoch Town Council seated round a table in the council chamber in 1910. Large portrait of the young Queen Victoria on far wall. Clockwise from man seated side on in foreground: Alex McLennan, Sidera, farmer and grocer; R R Johnstone, chemist; Robert Mackay, Westfield, King's Prize Winner, Bisley; William Sutherland, draper; Hector Mackay, Town Clerk; Dr James MacLachlan, Provost; W S Fraser, Senior Bailie, draper; George Macintosh, Pitgrudie; William Moore, tailor; George Kennedy, Links House.